Lewis Hamilton has increased his lead of the world championship to 19 points with victory in the German GP. Lewis Hamilton cruised to an unchallenged victory in yesterday's German Grand Prix to extend his lead over Mercedes teammate Nico Rosberg at the top of the Formula One world championship standings. Hamilton seized the advantage at the start from pole-sitter Rosberg, who drove an underwhelming race in front of his home fans at Hockenheim, and was never headed. "What a race, what a fantastic start. It was just about keeping it cool," Hamilton said. The Briton crossed the line 6.9 seconds ahead of Red Bull's Daniel Ricciardo, on the podium for the second race in a row on his 100th grand prix appearance. 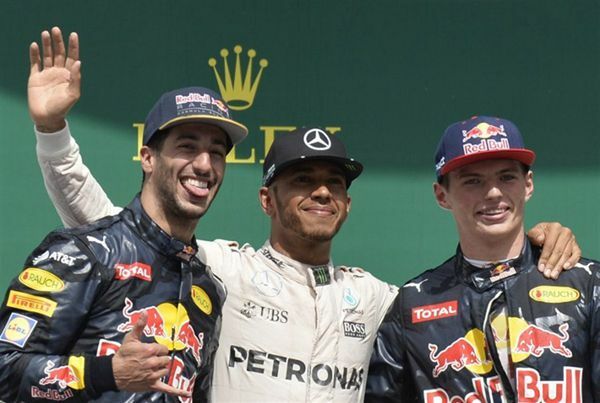 The Australian's Dutch teammate Max Verstappen finished third, his fourth top-three result, to give Red Bull its first double rostrum in over a year. Rosberg, who had looked unbeatable after topping every practice session, was only fourth after falling back at the start and collecting a five-second time-penalty for forcing Verstappen off the track. It was Hamilton's sixth victory in the last seven races and fourth in succession. The 49th of the reigning champion's career left him two adrift of Frenchman Alain Prost's mark of 51. He now leads Rosberg by 19 points in the standings with nine rounds of a record 21-race season remaining. "Get in there Lewis, great work mate. Beautiful start, fantastically managed," the Briton's Mercedes team said to him over the radio on the slowing down lap. "Fantastic job guys, awesome pitstops and just throughout the weekend as always, well deserved," Hamilton replied. Sebastian Vettel was fifth on his first appearance in Ferrari colors on home soil, crossing the line 32.5 seconds adrift of Hamilton, with Finnish teammate Kimi Raikkonen capping a disappointing weekend for the Italian team in sixth. German Nico Hulkenberg finished seventh for Force India, ahead of Britain's Jenson Button who brought home points for McLaren in eighth. Williams driver Valtteri Bottas of Finland was ninth ahead of Mexican Sergio Perez who handed Force India a double-points finish with 10th. Formula One now heads into its annual summer break before reconvening for the Belgian Grand Prix on August 28. Yesterday's result gave Hamilton, who trailed Rosberg by as many as 43 points following the Spanish Grand Prix in May, the crucial psychological edge in the title battle heading into the second half of the season. The Briton won at the iconic Spa-Francorchamps circuit last year.